Welcome to Ballinrobe Furniture & Carpet Centre Ltd.
Ballinrobe Furniture & Carpet Centre Ltd is located on the Neale Road, Ballinrobe, Co Mayo. 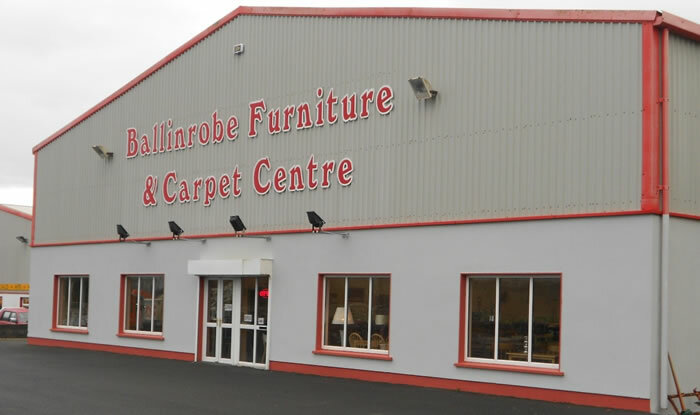 Ballinrobe Furniture & Carpet Centre Ltd have been in business for 22 years and have established a large satisfied customer base throughout Mayo, Galway and surrounding counties. In our furniture store at Ballinrobe, Co Mayo we stock a large selection of furniture and flooring which includes living room furniture, dining room furniture, beds and bedroom furniture, children’s furniture and office furniture. We try to offer a mix of modern and traditional furniture with value and quality in mind. In the flooring section we have an extensive choice of carpets, vinyl, rugs and wood flooring in many styles and colours to suit any room in your home or business at any budget. Need window blinds and curtains? Why not check out our selection of samples in a beautiful array colours and designs. If you cannot find the product you need on our website or need more information about any piece of furniture, flooring, curtains or window blinds please contact us by telephone on 094 9541877 or complete the enquiry form on our contact page or better still call in to our Store where we will do our best to help you.